Fowler’s “Ultra-Height” has evolved to bring you the finest digital height gage of its kind in the industry. 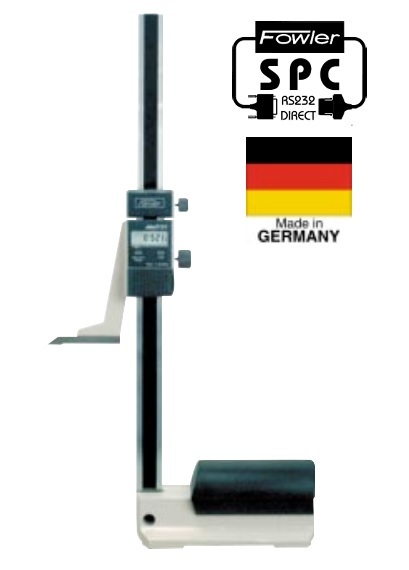 This unit is available in either 12″, 24″ or 40″ measuring range. • Lock screw: for scribing, transferring, etc. • Microfine adjustment screw. Lock screw locks unit before using fine adjustment screw. is unbreakable and not affected by oil, dust, chips, magnetism, shock, etc. • Robust base is fully hardened, ground and microlapped to ensure accuracy. Stressrelieved base. The base/scriber design allows direct zero reading from the base over the full range. Base size: length 6″, width 3-1⁄2″, height 2-1⁄2″.